This is such a marvelous idea for an anthology. 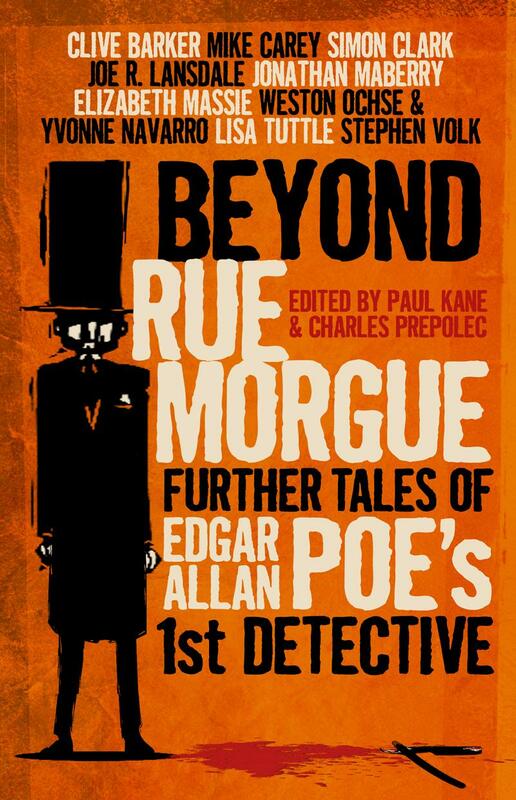 Editors Kane and Prepolec open the collection with their short essay on arguably literature’s first true fictional detective; Edgar Allan Poe’s C. August Dupin. Then they kick off the book with Poe’s seminal “Murders in the Rue Morgue,” which for anyone with little experience reading dated English prose, is a chore in itself. 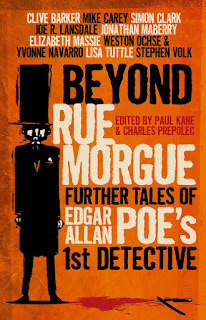 Whereas once the title classic has been put forth, the curtain opens to nine brand new stories inspired by Poe’s unique character. “The Sons of Tammany” by Mike Carey. The building of the Brooklyn Bridge and government corruption is the backdrop to this fast moving yarn. “The Unfathomed Darkness” by Simon Clark. A fanatical Danish cult sets out on a perilous airship pilgrimage only to end in twisted murder. “The Weight of a Dead Man,” by Weston Ochse & Yvonne Navarro. Dupin’s grandson, Pinkerton agent Nate Dupes, arrives in Arizona looking for a stolen painting only to get caught up with an ancient cult and a colorful Mexican bandito. An action packed pulper that is much fun. “The Vanishing Assassin,” by Jonathan Mayberry. Dupin solves the mystery of a butchered art dealer. “The Gruesome Affair of the Electric Blue Lightning,” by Joe R. Lansdale. This one throws in everything from Frankenstein to Lovecraft’s Elder Gods. “From Darkness, Emerged, Returned,” by Elizabeth Massie. A nice little psychological thriller that was my least favorite. Not because it is badly written but because it’s tenuous connection to the theme. “After The End,” by Lisa Tuttle. This tale is so cleverly plotted; the writer’s prophecy at the end is eerily effective. “The Purloined Face,” by Stephen Volk. A truly fanciful tale wherein Dupin is actually Edgar Allen Poe; having faked his own death back in America and retired to Paris to pursue his new career as a detective. His assistant and narrator of the tale is none other than a young Sherlock Holmes and together they seek to unravel the true identity of the Phantom of the Opera. A truly imaginative, wonderful story. Easily my favorite of this collection. “New Murders in the Rue Morgue,” by Clive Barker. When an American descendant of the Dupin returns to Paris, he finds line between fiction and reality blurred in a truly horrifying tale. In all this is an eclectic, fun anthology worthy of your attention and support. Sangster was one of the best killers in the death-dealing business until one day he woke to discover he had a soul. Translate to conscience and because of that unexpected epiphany, he retired immediately. Now, one of his few friends aware of his old career, Catholic priest Father Patrick, comes to Sangster looking for help. Years earlier, while assigned to a parish in Philadelphia, a young twelve year old altar boy committed suicide after claiming he had been abused by a priest. Father Patrick swore he was not that priest, whereas the boy’s father, mobster Jimmy Abbatello doesn’t believe him and puts out a contract on the cleric. The Bishop quickly has him reassigned to a parish in New Orleans and for the next decade Father Patrick believes he’s actually escaped the obsessed Abatello. Then one day the priest runs into one of the old Philly hoods in a public square. Though he ducks away fast, he is unsure as to whether the fellow spotted him. Worried that such is the case, he seeks out Sangster and thus the novel begins. 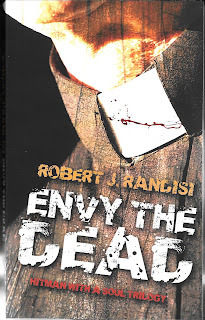 Randisi is one of those old pros in the crime genre who has gotten so good at telling these kinds of stories, his prose is economical and his dialogue sharp, crisp and fun. These are the traits every writer works at as they are the elements that make prose either convoluted or, like this novel, enjoyably readable. The pages seem to turn themselves, that’s how smoothly Randasi spins his tale. Sangster reluctantly agrees to help and eventually learns a notorious hitman known as Frankie Trigger has taken the contract and is already in New Orleans. But Sangster isn’t without his own support in the retired ex-Sheriff Burke, a wiry character always ready for a little action. If all this wasn’t enough, Sangster gets another surprise when a beautiful young woman named Roxy shows up claiming to be the daughter of his former controller. She wants Sangster to teach her to be a hired gun. “Envy The Dead,” is one of those rare thrillers that delivers memorable moments without ever straining credibility. In the end, it’s about people, flawed, imperfect and simply wanted to get by in a world too often cold and uncaring. This is the sixth Isaac Bell thriller from writer Justin Scott. For the record, Clive Cussler created the characters and set up for the series in his book, “The Chase,” then handed it off to the Scott to continue. Which in our opinion is both genius and bothersome. Genius because Justin Scott is an amazing writer, bothersome in that for purely promotion purposes, the publishers always slap Cussler’s name over these books in a giant font with Scott’s shrunk down to near invisibility beneath it. But, good or bad, these cottage series have been around forever. It obvious the books make tons of money and Mr. Scott’s ego is surely compensated by his share of the royalties. As this is one of our current favorite series currently being written, we just had to vent a bit. Now on to the actual review. Set in 1921, Prohibition is the law of the land and causing havoc across the country. In an attempt to keep his prestigious detective company free of corruption, Joseph Van Horn offers his company’s services to the Coast Guard. On an inspection tour with one of their patrol boats, they come under attack from bootleggers operating a super-fast armored cruiser equipped with machine guns. Van Horn is wounded in the confrontation and almost dies. That is all the motivation his chief agent and protégé Isaac Bell needs to mount a full out offensive against the cunning operators of that incredible but deadly speedboat. Bell will stop at nothing to find the bootleggers and bring them to justice. But as the investigation mounts, Bell uncovers evidence that the owner of the black rum-runner may not be a simple criminal after all. With the help of Pauline Grandzau, the lovely Van Dorn agent in charge of their Berlin office, he learns that the mysterious master mind behind the increase in bootlegging activities may be a Russian Bolshevik spy whose purpose is complete destruction of America’s democratic government. Using the sale of illegal, rut-gut booze, this foreign provocateur audaciously plans to finance his campaign of terror via his quickly amassing wealth from his bootlegging operations. 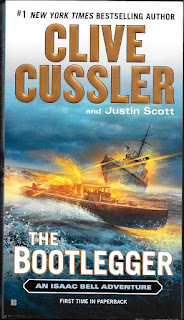 From the waters of the Great Lakes down to the old speakeasies of Detroit and ending in the crystal blue waters of the Caribbean, “The Bootlegger” is a non-stop thrill ride that never once lets up, skillfully building suspense to a powerful, explosive finale pitting an old fashion hero against a heartless monster in a contest that only one will survive. We’ve never once been disappointed by an Isasc Bell thriller and this one is certainly no exception. A few weeks ago we wrote our first review of an ongoing Hard Case Crime comic series from Titan Comics. Now we’re turning our attention on a shorter, 5 issue mini-series by the established filmmaker Walker Hill and adapted for comics by Matz. To the hermit cave-dwellers among you, Walter Hill is an American film director, screenwriter and producer widely known for his over-the- action films. Some critics credit him with reviving the Western genre. Hill is often quoted as saying everything he’s ever written is a Western. Among his most popular films were The Warriors, Hard Times, The Driver, Southern Comfort, Steets of Fire, 48 Hrs and Last Man Standing. 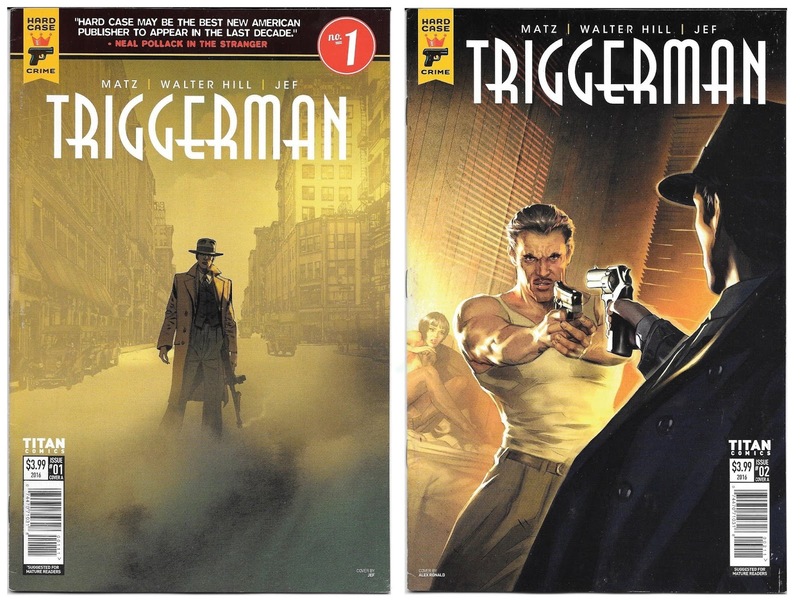 In “Triggerman,” two low-life mobsters have reneged on a deal with Big Al Capone and disappeared with his money. The wrinkle here is they also fled with Lena Dorsey, the former girlfriend of convicted mob hitman, Roy “Triggerman” Nash currently incarnated in the Big House. Capone has Nash sprung from prison on the condition he find the two idiots and teach a permanent lesson in what happens to people who cross Big Al. As to the money and the girl, Nash can have them. And so begins a violent chase which leads Nash to the arid dessert of Arizona and finally to the streets of Los Angeles. Along the way he leaves trail of bodies while igniting bad blood with local bosses and crooked cops. Subtlety isn’t Nash’s style and he’s a man of few words, preferring to shoot first and then pick up whatever pieces are left. 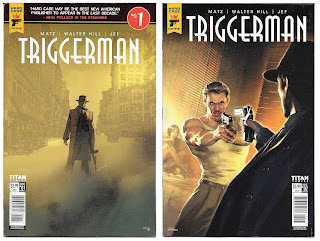 “Triggerman” from the first page of issue # 1 to last of # 5 is one of Hill’s best damn stories ever and this reviewer has to wonder why it has never been filmed. Whereas any half-decent filmmaker would be three steps ahead of the game by using the graphics in this comic as his or her storyboards. We’re new to artist Jef, but it’s obvious he loves this prohibition era genre and his art throughout is simply gorgeous. His lines are tight and precise and the perfect sponge for the muted colors used throughout the series. “Triggerman” is a fast paced, brutal, crime drama told with an economy of words that is dark poetry. Somebody please make this a movie. Last year I was contacted by writer Billie Rae Bates. She was in the process of writing what would be the most comprehensive book ever done on the 60’s Green Hornet TV series starring Van Williams as Britt Reid and Bruce Lee as Kato. Whereas I’d subsequently written those characters in my early 90s Green Hornet comic series from Now Comics, Billie reached out to me. We spent a couple of hours one afternoon as she picked my memories about how that comic series came about, what my own feelings were concerning that TV show etc. etc. etc. Now that book is finished and in print and it is simply a fantastic work of research. Billie starts at the beginning, giving readers an encapsulated history of GH from his origins at WXYZ, the Detroit radio station owned by George Trendle; how Trendle and his top writer, Fran Striker invented the Green Hornet to follow their unheralded success with their western drama, the Lone Ranger. Then she moves over the two Universal movie serials and finally comes to the crux of this massive tome, the television show put together by producer Bill Dozier that so captured the imagination of fans around the world. The book gives us a break down to all 26 episodes, anecdotes about the cast, the building of the fantastic automobile known as the Black Beauty and hundreds of other details meticulously set forth in this truly fabulous book. Several years ago, writer cultural historian Martin Gram wowed GH fans with his brilliant giant volume on the entire history of the character’s radio exploits. With “LET’S ROLL, KATO,” Billie Rae Bates has given us a magnificent companion title to stand right alongside that masterpiece. 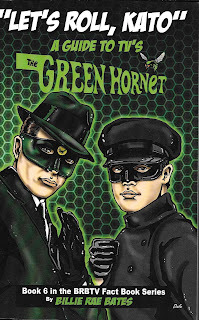 No real Green Hornet & Kato fan should be without this treasure. Imagine the history of the post Civil War era 1864 to 1900 as told through the eyes of Sam Peckinpah’s Wild Bunch. If you can do that, then you’ve a half-way decent chance of understanding this violent saga of brutality born on countless battlefields and then unleashed on a burgeoning frontier like a twisted, blood-letting plague. At the center of it all is Augustus Winter, a young man raised by a heartless preacher whose only touch was that of a leather strap. 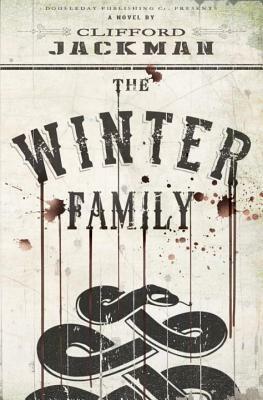 In the Union Army, as part of Sherman’s scorched-earth march to the sea through Georgia, Winter finds himself surrounded by other broken souls. Men whose moral compasses are shattered by the horrors that surround them until to survive, they give in to their primal natures and become comfortable with meting out death and destruction to all who cross their paths. These include Quentin Ross, a bonafide psychopath who takes pleasure in killing women and children. Fred Jackson, a freed slave wanting only to flee his tortured past and make a new start. The empire brothers, Johnny Charlie, two reckless, simpletons soon addicted to violence until it is the only thing they relish. Bill Bread, the alcoholic Indian seeking redemption in a bottle and Sgt. Jan Mueller, a German immigrant conscripted into the army the second he stepped off the boat in New York. By the time the war is over, these men find themselves unwilling to give up their killing ways. They soon become federal agents hunting members of the Klan. When that campaign ultimately wanes along with the half-hearted reconstruction of the South, they move ever westward until they arrive in Chicago as hired mercenaries for the Republican Party to assure a victory in the next municipal elections. When that goes awry, the Winter Family, as they are ultimately named by the authorities head to the badlands of Oklahoma as unrelenting scalp-hunters after the bounty placed on the renegade apache named Geronimo. Like “The Wild Bunch,” the Winter Family is racing against time and the ever encroaching juggernaut that is civilization. Their world is diminishing and they are all too aware none of them will die of old age. This book is filled with one frenetic gun fight after another until the finale when the last of the bad men charge headlong into hell with guns blazing. 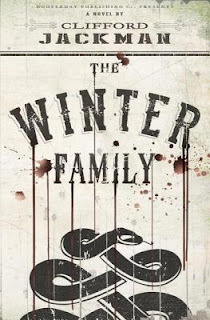 “The Winter Family” is a reading experience you’ll remember long after you’ve finished it. Jackman is a born storyteller who leaves it all on the page. We can’t see what he offers up next, though topping this book will prove to be a real challenge.